George is with us for work experience this week and next. 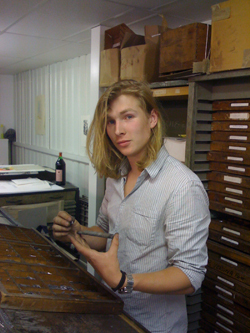 He is an illustrator, and also works for our friends The Wyvern Bindery. We made this little book for a talk at the Art Workers Guild about the restoration of St Pancras station. Stephanie Gerra, a member of the Guild, wrote a poem about the newly opened station, which made a very pretty four page book designed by Brian Webb.